Tauranga’s motocross prodigy Brodie Connolly. Photo: Sarrah Cowdell. At 14 years of age, Tauranga’s Brodie Connolly is something of a motorsport veteran. Bikes are his weapon of choice. Specifically, pushing them, and himself, to the limits in the rugged terrain and flying dirt of the world of motocross. He’s been in the saddle since his first bike was handed down to him from a cousin at the age of four. That lit the fire, and having the perfect environment to hone his skills around his parents’ farm on the rustic side of Welcome Bay fanned the flames. Not that he needs a reason, but if you must, he has one of the best. It’s on the verge of being more than just fun, though, for this serial national age group title winner and Year 10 Tauranga Boys’ College student. Now he’s about to take on the best from around the globe. In a little over three weeks he’s crossing the ditch to ride in the World Junior Motocross Championships in Horsham, Victoria, Australia – and not just to make up the numbers. For a competitor who’s used to leaving his local rivals eating his dust, the challenge of competing against the top riders from Europe, the US, Australia, and the rest of the motocross world, is right up there. It’s got to be a bit daunting, though? It’s always been ‘a big dream,’ Brodie says, to make it in the global big time of professional motocross, and the junior worlds are a major waypoint on the route there. He’s already put together an impressive CV on his journey to the summit of the sport. He has eight consecutive New Zealand Grand Prix titles and six New Zealand Motocross Championships – the first at the age of nine – under his belt. He’s already distinguished himself across the ditch as well, with runner-up finishes in last year’s Australian Junior Motocross and Supercross championships. 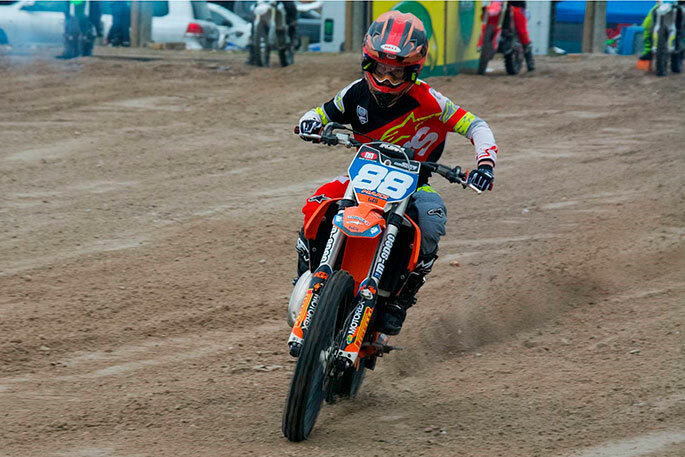 In April this year, having cleaned up yet another New Zealand Junior Motocross title in the 12-14-year-old 125cc category in Mosgiel, he was one of four riders named for the Kiwi team to cross the Tasman for the worlds, following a tough selection process. That was an achievement in itself. The selectors looked at the results the contenders had put together in previous events, and made a judgement on their competitiveness on the global stage. It was always pretty obvious Brodie had the complete package. He’s got the skills, the results – and no shortage of hunger. In fact, he says, it’s often Mum and Dad who are begging for a break. Because the weekends, when you have a son who’s combining a motocross world championship with the not insignificant matter of getting a high school education, are all about preparation. “Every weekend I ride,” says Brodie. That can be in locations all over the country, which means parents become chauffeurs in addition to the regular duties of financiers and, in Dad’s case, mechanic. Funding Brodie’s ventures, around the country as well as overseas, would be a serious challenge without the support they get from a sizeable array of sponsors, says Gavin. Local Tauranga businesses Steel Construction Services and Makz Gear, who’ve sponsored Brodie since he was about five, are two who’ve provided outstanding support. New Zealand’s former world motocross champion Ben Townley volunteers his time to coach Brodie and his kiwi teammates, and his fitness owes a lot to the training he gets from former world BMX champ Kurt Pickard at KP Performance, Aspire Gym. They fly out to Australia on August 20, ready for the Junior World Championships on August 25 and 26. Brodie will be going hard out, but whatever he achieves on the track, there’s a philosophical lesson he has already mastered.